Last weekend, I went to Delaware to attend a surprise party for my cousin’s birthday. It was a milestone birthday, so I couldn’t pass up the chance to help celebrate. It was a blast to spend the afternoon having lunch and catching up with family and family friends. The bonus of the weekend was that I flew in and out of Baltimore, so I also had an extended visit with my sister Jane (and a brief visit with my other sister Jennifer, but only at the party). My sister Jane lives on a farm, though she, personally, does little in the way of farming. Her father-in-law takes charge of the agriculture and animal husbandry going on there. It is peak asparagus season in Maryland. Although Jane and I didn’t have time to cook together this trip, I was fortunate to be able to stash a bundle of freshly picked asparagus spears from their garden in my luggage. 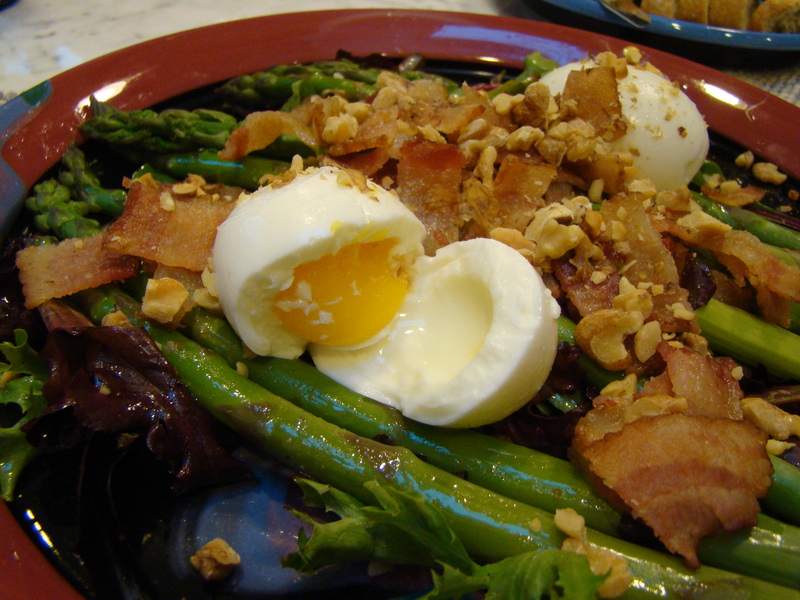 Perfect for this week’s FFwD (French Fridays with Dorie) recipe: Bacon and Eggs and Asparagus Salad! I really loved last week’s spinach and bacon quiche, so I’m not sure what superlative to use for this week’s salad which I loved even more, by leaps and bounds. True confessions, I do love salad for dinner. I made the full recipe and split it between the two of us for dinner, two eggs each. This salad had so many different flavors and textures. There was the piquant vinaigrette on the salad greens, the salty bacon, the grassy asparagus, the runny eggs, all topped with toasty walnuts. It was having a party in my mouth. On the downside, there were a lot of components to pull together, but each was easy to get ready and some steps could be done simultaneously. It came together faster than I expected. My only gripe about this recipe is the eggs. First, I wish my eggs had been a little runnier. I cooked the eggs for the recommended 6 minutes. I’m thinking maybe I didn’t run them under cold water for long enough. They weren’t hard-boiled, but they were a little past soft-boiled. In any case, I thought that the egg part was fussy. The eggs were boiled, peeled, and warmed in bacon fat. Next time, I’ll just poach the eggs, which will be slightly less attractive, but easier for me (I don’t really like peeling boiled eggs). I liked the vinaigrette so much that I made it again later in the week for tossing with more salad. I think it will get rolled into the salad dressing repertoire. As I said, I adored this salad. Asparagus season is short, so I’m excited to read about any substitutions the other FFwD bloggers might have tried. You can check out their posts by following the links from French Fridays with Dorie. You can find the recipe in the cookbook, Dorie Greenspan’s Around My French Table. 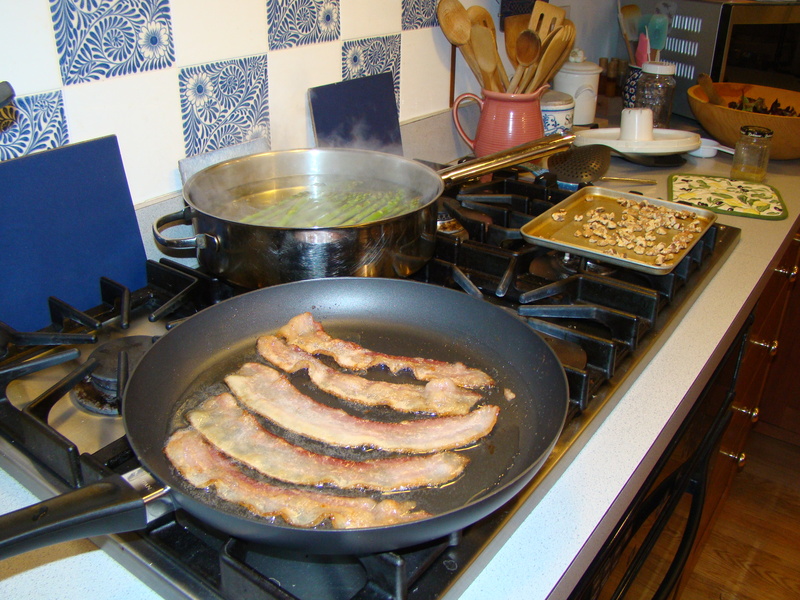 Posted on 20 May 2011, in French Fridays with Dorie and tagged asparagus, bacon, eggs, French Fridays with Dorie, salad. Bookmark the permalink. 20 Comments. Looking at that bucket of freshly picked asparagus, I suddenly get a pang of asparagus envy…how lucky you are! Yes, poaching the egg is a good idea, in fact, I will do that next time too ;-). If it helps, I removed my eggs after the six minute mark and placed them on an ice bath. I didn’t get around peeling and using them until a full hour later, and the yolk was still runny enough for me. I also liked this salad very much! Beautiful photo of your finished salad, Betsy! How wonderful that you were able to use freshly picked asparagus! I think this salad would be delicious no matter how the egg is cooked – I just loved all the flavors dancing around in my mouth! Your dish looks great! And, I’m jealous as to how much fresh asparagus you have! How lucky are you to get those beautiful fresh asparagus? Your salad looks so wonderfully delicious! This was such a great salad with so many great flavors and textures! A true winner! I love it too! The 6 min worked well for mine though I used jumbo size eggs. Those freshly-picked asparagus looked divine. I’m envious! That fresh asparagus really brings back memories and it is so much better than what we get in the grocery store. Lucky you! We also enjoyed the variety of textures and tastes in the salad making it one to make again very soon. The freshly picked asparagus is beautiful in the sink, it looks farm fresh! 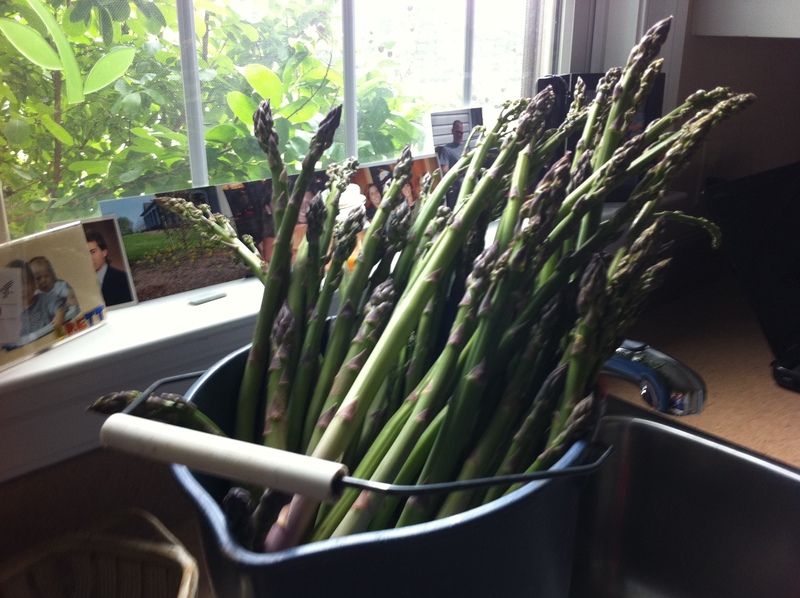 I especially love your photo of the asparagus – how lucky to have had access to that just as the season hit its peak! I was surprised at how quickly the salad came together, too. I think it would make a great brunch dish – impressive but easy enough that you have lots of time for visiting. I loved the vinegarette too and it’s the only component I can see me making again. Your salad looks lovely – so glad you enjoyed it! I wish I had been able to find fresh beautiful asparagus like yours. The salad is beautiful. I agree, the egg part was a bit fussy, but worth it. So great that you were able to use fresh picked asparagus. Next time, I’ll make the full recipe and split between two. not get to sample Nana’s recipes. Look at that googy egg – I want! I poached my eggs mostly so I wouldn’t have to peel the boiled eggs – sounded tricky! Your salad looks lovely, and I bet it was fabulous with those garden-fresh asparagus! That pic of the asparagus is gorgeous! And your salad looks amazing!